And so it all ends. Throughout today and yesterday, I completed the final task that lay before me: editing the audio tour files with the background music. The music sampling the musician recorded last week runs for only a minute and a half, so yesterday I uploaded the audio files onto editing software so that I could copy and paste the accompanying music. I had done this before, mostly in high school with more outdated software, I spent only about an hour getting reacquainted to the software and completing the task set before me. Today, I completed the task by listening to the recording over again, tweaking the audio files slightly to account for any distortion heard by the listener while walking along the exhibition. And with that, I completed my internship project! For the past few months, I have spent countless hours researching Point''s life, cataloging the art, and organizing the twenty columns. I gained an appreciation for museum work, artistic analysis and audio recording. Before this semester, I never really thought about museum work as a possible career opportunity. But with my experience working with Professor Schloesser, I now know that museum work is a possible avenue for me after my academic career. And with that, I hope you all had almost half as much fun reading my blogs as I had writing them and working on my internship. Till the next time! Hello everyone! Sorry about the noted silence-I was travelling over the past week and had difficulty getting to a computer. This week, I delved deep into the task at hand: organizing and cataloging the drawings. As such, I began with dividing all of the drawings into one of five categories: landscapes, religious scenes, battle sequences, village scenes or portraits. 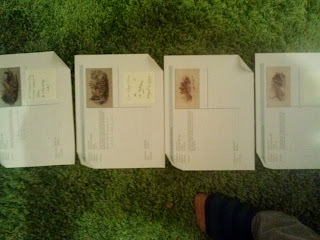 Beginning with religious scenes, I went through each of the drawings, looking for any indications of the year it was written or geographic location in order to construct a historical map of Point's works. This is easier said than done. Often, the drawings featured only faint references to regional landmarks, and dating each drawing was a particular difficulty. 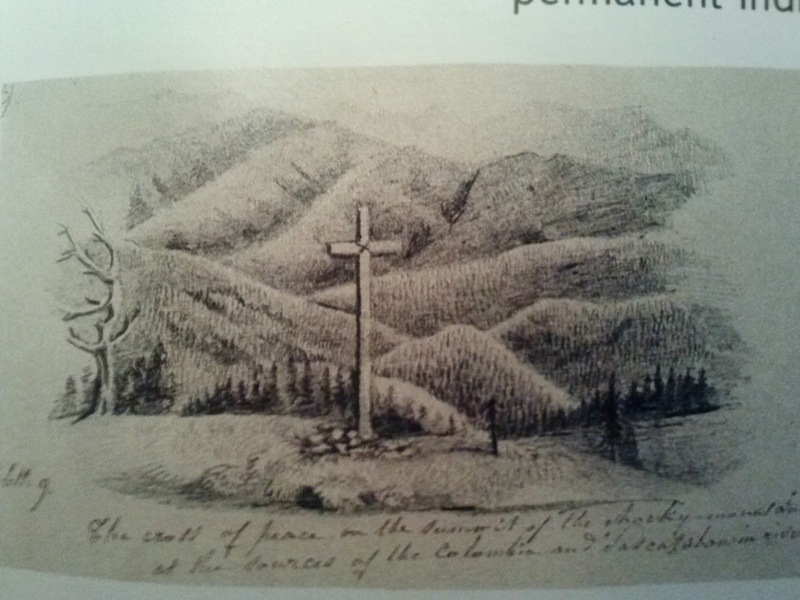 One such work, a drawing of an elevated cross in front of the towering Rocky Mountains, offered little in the way of indications to date or location. 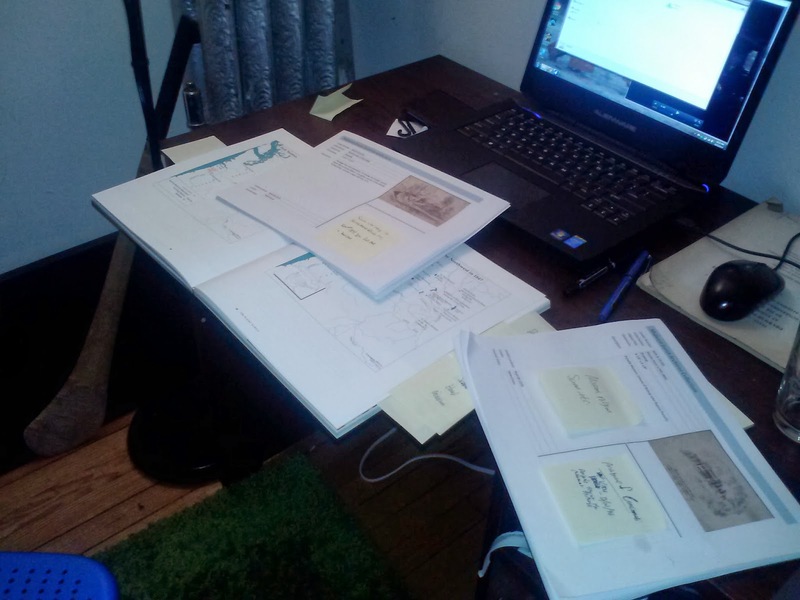 As such, I spent a good portion of time combing through the several research materials for help. 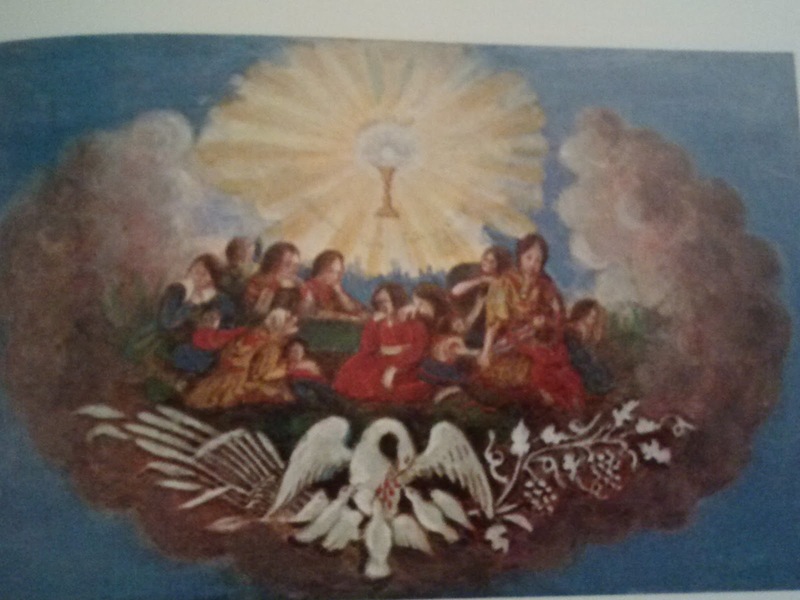 Luckily, I found a picture of the drawing on Sacred Encounters, and that offered a somewhat helpful time span to narrow the focus. This issue arose several times in the last week. Apart from the frustrations one associates with organizing somewhat vague, yet extremely vivid, drawings, this week was relatively low in problems. 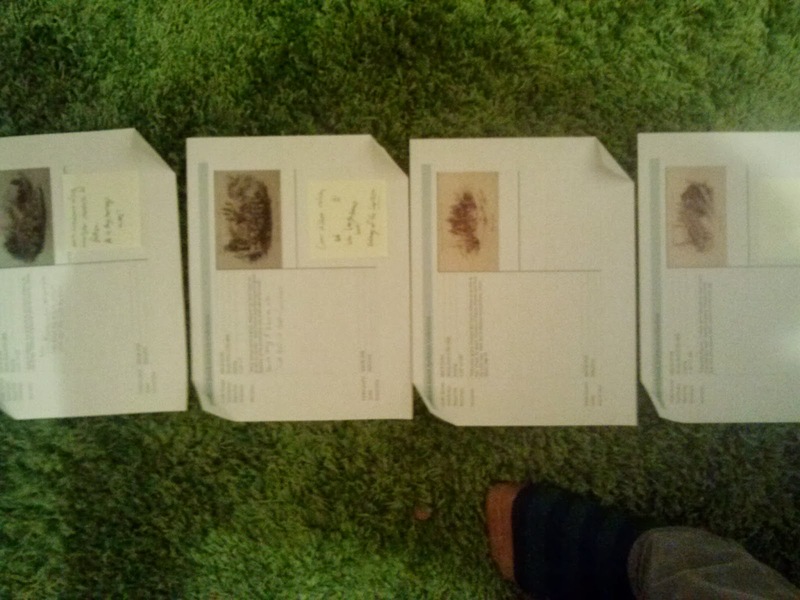 The only remaining issue remains the scale of drawings that need to be analyzed, and so the only thing I can do for now is to work as much as I can to get all of these drawings initially cataloged. And due to the fact that my work-space is my room-which stems from the independent nature of this internship-it seems that I will remained attached to my desk for at least the next week. Greeting again! This week I continued my slow but steady journey through the life of Nicholas Point and his journeys in what eventually became the western United States. However, while last week was devoted almost entirely to examining paintings alongside Point's experiences, this week witnessed this lone historian battling through Nicholas Point S.J: His Life and Northwest Indian Chronicles by Cornelius M. Buckley S.J. Dedicated to the Oregon Jesuits who are continuing the work begun by Point and his compatriots, this biography charts Point's early life growing up in Revolutionary, and later Napoleonic and Restorative, France and experiencing the violence inherent in such a time. Reading about this pious man's early life is illuminating, primarily as it benefits my understanding Point not only as a subject of this internship but also as a man. 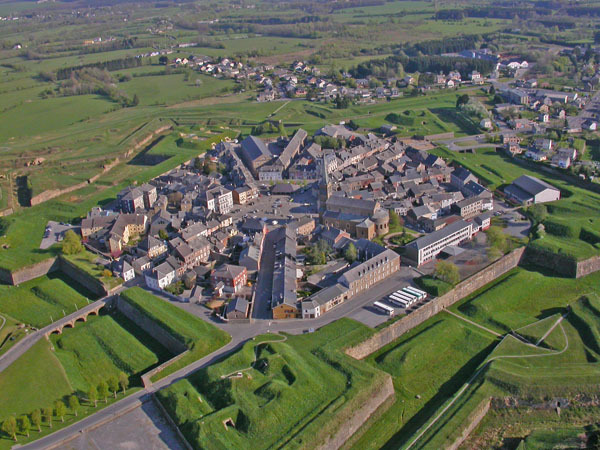 Point was born in the late eighteenth century in France to a soon-to-be widowed mother, and as a young man he witnessed the terrible violence and warfare that waged between the great powers of Europe. 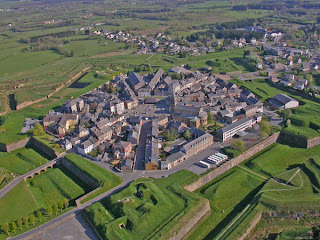 A perfect example incorporating Point's piety with this historical context is described very early on in the book: shortly after Austria rejoined a coalition against Napoleon, the allies attacked near Point's home in Rocroi. During a battle near his home, Point collected what he could from his employer's office when a shell landed only feet away-covering him only in dust and gravel. Point attributed his good luck to the Blessed Virgin, an early indicator of his religious fervor. This story shows the reader how close Point was to a military, and therefore violent, world. After his mother died, Point contemplated joining the military to make ends meet. However, this martial lens is evident throughout Point's life. Buckley spends much time describing how Point's first experiences in a Jesuit camp resembled a spiritual boot camp, stressing the strict obedience taught to the initiates and Ignatian focus of the training: to create soldiers for Christ. While he was sent home once, although later readmitted to training, the impact of this military style-religious preparation arises in his experiences among the natives. during his time with the Blackfeet, Point describes in a letter how he wishes to "conquer" the Crow nation for the Lord.. 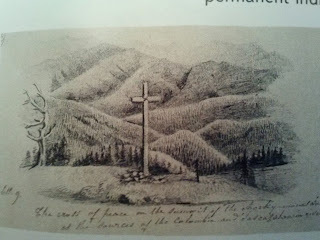 Furthermore, in several of Point's letters he wrote he includes rather terse and simple explanations of gruesome battles-in the third letter he explains, quite simply, how the Flathead defeated the Blackfeet so resoundingly that they suffered only four casualties while twenty-one of their opponents lay unburied. These contexts for Point dramatically changed what I thought about the man I will be working "with" for the next few months. When I first heard his story, I figured he was a simple, meek and delicate priest who bit off more than he could chew, so to speak. Now, under the contexts of his upbringing, training and writings, I see him as a rough soldier of God, willing to go to the farthest ends of the world at the time, the American frontier, in order to serve his cause. 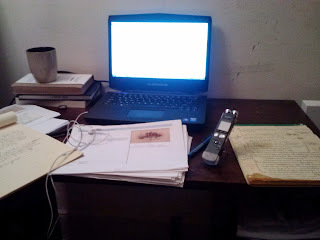 As such, after reading two considerable texts on Point, several primary documents from the man, and studying his artwork as well as I could in the past few weeks, I believe I will be moving beyond the the realm of research to the more interpretive and analytic aspects of this internship in the coming weeks. Instead of pouring over books telling the story of the hard-knocked Jesuit, I will be focusing on his art, detailing their themes and compiling a basic chronology. This week, my main focus was on researching Father Point's life and his interactions with various Native American tribes living within the American frontier. In order to aid in my research, my internship supervisor Professor Stephen Schloesser, sent me two books. 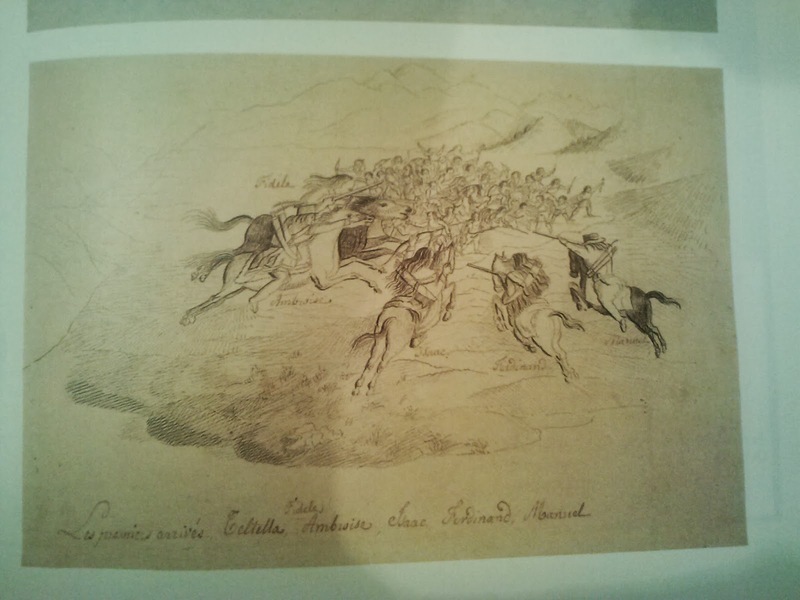 The first, Sacred Encounters, provided me with dozens of examples of Point's drawings and paintings he completed during his time among the Native Americans. 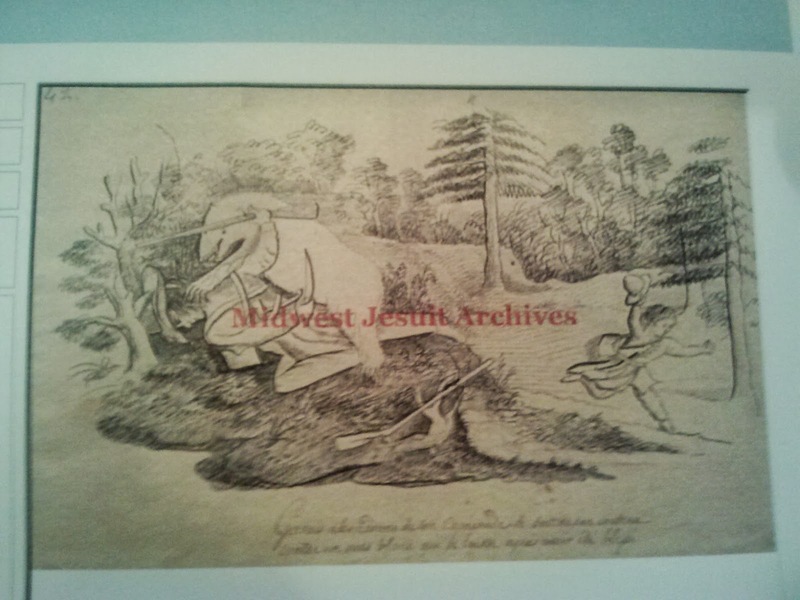 Sacred Encounters also gave me images of several articles of Indian culture, including pictures of Indian clothing and tools Point would have encountered during his travels. However, it was the second book, Wilderness Kingdom, that proved to be the most informative and helpful text in my research. 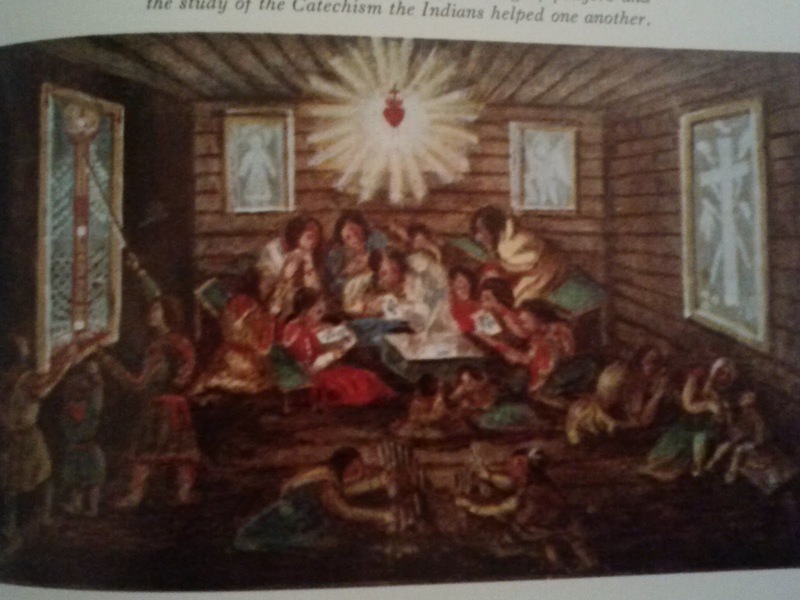 Detailing Point's life before his ventures into the American frontier during the mid-nineteenth century, the text's introduction quickly established Point as an educator and as a deeply religious Jesuit who nonetheless retained a particular skill for art that originated in his childhood. 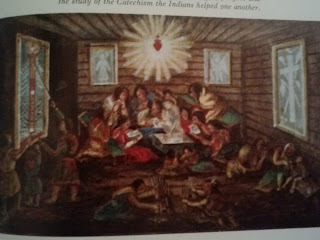 The editor's introduction stressed the fact that Point was dedicated to education throughout his life, opening the St. Charles College in 1838, and sought to convert and educate the American Indians in the ways of Catholicism. The beginning of his ventures was of particular interest to me, as the editor describes how representatives of the Flathead tribe traveled thousands of miles to petition the Jesuits to come to them rather than the other way around! 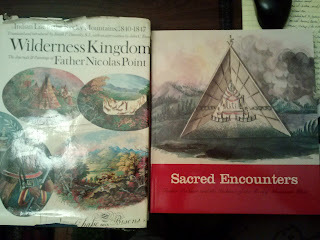 Wilderness Kingdom, for the most part, contained excerpts from Point's own journals as well as paintings and drawings he made during his travels. While reading the text, I took notes in order to construct a basic timeline of Point's travels so that later in the internship I may organize the drawings chronologically. Within the journal entries, Point mostly describes his time among various Indian tribes, from the Flathead to the Coeur d' Alenes to the Blackfeet, while often describing conversion experiences. The drawings and paintings meanwhile depicted a variety of subjects. 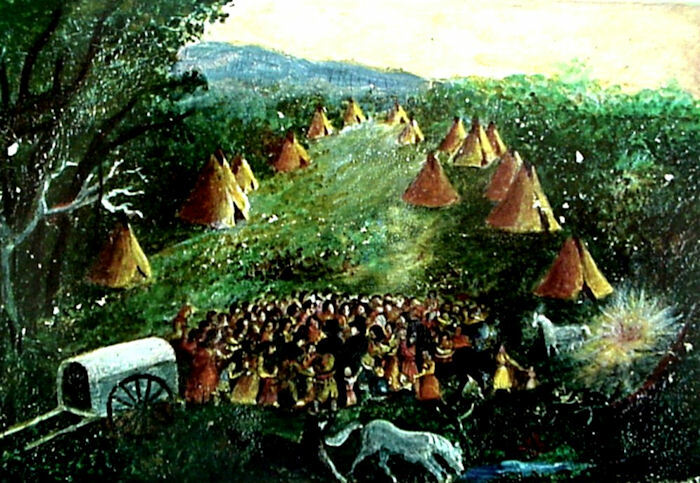 Slowly, after analyzing dozens of Point's pieces within Wilderness Kingdom, I began to identify a several recurring themes of Point's paintings, most notably religious ceremonies within the tribe and landscapes of the contemporary United States. After reading these general research guides this last week, I will be diving head first in the coming week into a much more dense biography of Nicholas Point to gain more insight into his life and his artistic themes. Greetings world! My name is Liam Brew, and I am currently a senior at Loyola University Chicago pursuing a major in history and a minor in English. This semester, I am interning with Professor Stephen Schloesser and am helping in a project centered around the life and art of Father Nicholas Point, a nineteenth century Jesuit who lived and ventured in the American frontier and interacted with native Americans. After speaking with Professor Schloesser a week ago, we agreed that my duties for the next few months would be to research Point's life and art, analyze or interpret many of his drawings, categorize said drawings based upon basic chronology or theme, and write wall texts for each piece for an exhibition occurring some time in the near future. 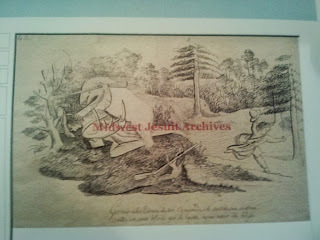 drawings, depicting frontier Jesuit missions, native American villages and warriors as well as landscapes of the soon-to-be American countryside, I became excited at the prospect of learning more about an area of American history I know relatively little about. Throughout my collegiate career, I have focused on modern European history, and I welcome the chance to learn about frontier history. 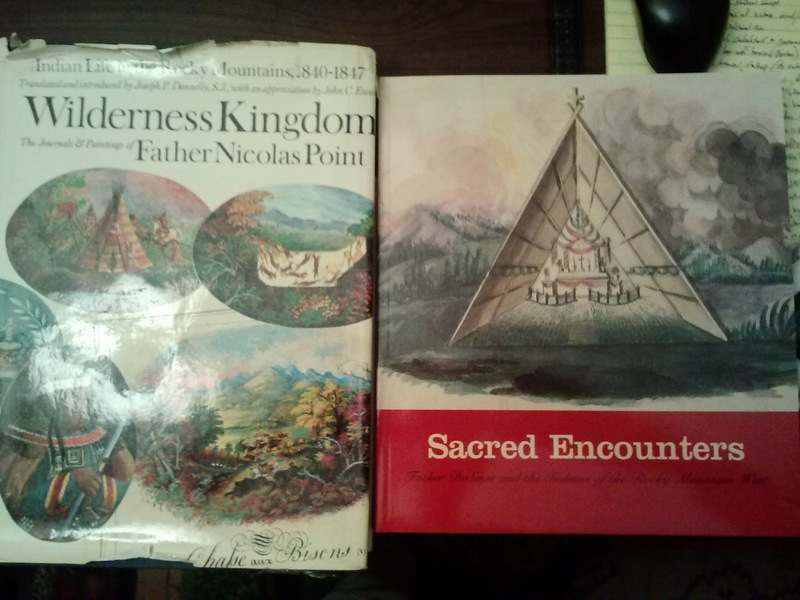 In preparation to cataloging and categorizing Point's pieces, I will be reading Wilderness Kingdom and Sacred Encounters along with a standard biography of Point's life in the frontier. The internship itself is mutli-layered and consists of several well defined tasks. In order to create a general or basic chronology of Point's pieces, I will be gleaming clues and hints that indicate the year and location of the drawing. I will also be tasked with categorizing the pieces in terms of their themes and subjects. Essentially, I am in charge of analyzing and organizing one wall of Point's art for the exhibition at the Loyola University Museum of Art, and writing wall texts for each piece. Given the antonymous nature of the internship, I will doing the vast majority of these tasks in my apartment or in the Loyola University library. And so begins the adventure into the life, times and works of Father Nicholas Point!